First of all, what are the Blackout Days? 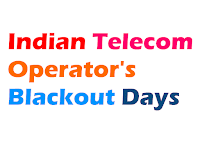 Blackout Days are those days in a calender year on which a particular Indian telecom operator charges extra to its customers for SMS and in some case calls also. Simply if you send an SMS to any number on these days, your SMS promo pack will not work and in the same way your call rate cutter packs will not work. So, in this post I've tried to list the blackout days that the Indian telecom service providers count.